Monica Vaglietti is a corps de ballet dancer at La Scala in Milan. She is also an animal lover. Greyhounds especially. Nothing exceptional so far, but there is something that makes Monica unusual. 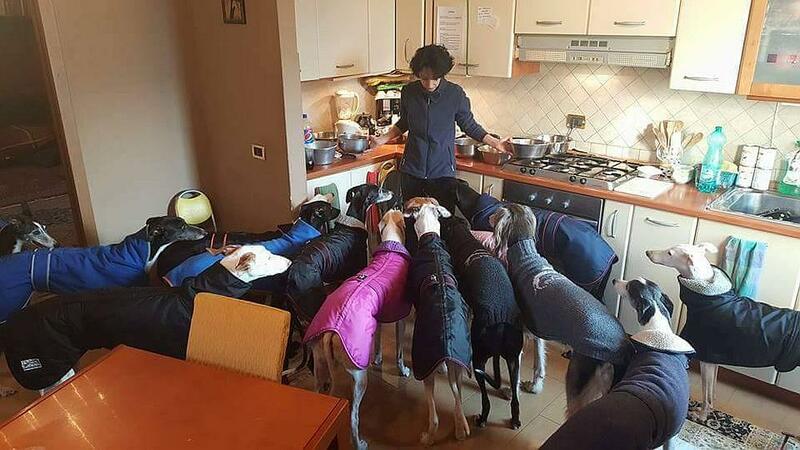 So, Monica, just how many Greyhounds do you have? Thirteen! Though, to be precise, one is actually an Ibizan Hound, Filippo. That isn’t normal, is it? Why so many? Well, I was born in a home where there was a dog, a cat, and a goldfish – which wasn’t gold or red, but white – and also a canary that we inherited after the death of my grandmother, so animals have also been present in my life, and greatly loved. My parents taught me to love them and respect them. My brother has a dog and two cats. Yes, but there’s a big difference between a dog and two cats and 13 Greyhounds! How did that come about? Well, when I moved out to live by myself, it wasn’t possible for me to keep animals at first. Then, before I had my Greyhounds, I adopted a female Doberman from a kennel – another breed I love – and a Belgian Shepherd cross. Both were quite old when they died: the Doberman was 12 and the Shepherd was 22! Greyhounds have always been my favourite breed but for ethical reasons I didn’t want to buy one when kennels are bursting at the seams. It had always been my secret wish until, nine years ago, I came across an appeal on the internet to save a Greyhound who was being kept on a chain. At the time, I couldn’t help out because I already had two dogs, but I discovered an unknown world, that of Greyhound rescue. Then, in 2008, after my Doberman died, I adopted my first Greyhound… Picasso! About two years after the death of my Shepherd, I adopted Padme from the association that my partner is president of, the European Greyhound Network. It was that adoption that brought the two of us together. He already had two Greyhounds and we went from 4 to 13 in a flash. So, you adopt the mall from the EGN? In a way! Being the president of the EGN association is voluntary; however, we have the responsibility to take back the dog’s adopters find uncontrollable or maybe too old, and sometimes it’s difficult to find new adopters… though, I should confess, once they have found a place in our home it is difficult to separate ourselves from them. Many people ask that, but to tell the truth it isn’t. It is certainly demanding but we don’t think of it as a sacrifice because that would imply something negative. It would be the same as saying that your children are a sacrifice. Maybe for some people that’s true, but not for us. It’s a choice that we have made, maybe a bit odd, but it gives us a lot of happiness. My partner, Dario, is a canine educator and trainer with SIUA, the Istituto di Formazione Zooantropologica, one of the best and comprehensive schools which trains the dog trainers. It was founded by Roberto Marchesini in 1997, based on ‘zooantropologia’, a discipline that deals with the relationship between humans and other species. Dario’s knowledge and skill, in addition to our immense love for them all, has allowed us to be able to keep and manage so many dogs. Certainly, our lives have changed, and much is centred on the welfare of our ‘children’, but that’s what makes it all so full and satisfying! The logistics of it all must be difficult. The daily running of our family is rather laborious because it’s all organized according to my working hours, which are not flexible. Depending on my schedule of classes, rehearsals and performances at La Scala, Dario then organises his weekly appointments with his clients, though at weekends he is almost always occupied giving lectures for SIUA, where he teaches. Around this we organise a couple of daily outings with the dogs, in groups, for a walk; sometimes before work, sometimes in the evening. On the days when both of us need to work at the same time, we have some girls who come in to keep an eye on them and keep them company… they are never left alone. Often my mother, ‘la nonna’, comes to look after them, and if not we find a dog-sitter. So, how do you walk 13 dogs? Obviously, I would be telling a lie if I told you that we take all the dogs out every day. We’re not Superman! It would be impossible with so many, but we take them out in turns. And for the dogs who stay at home? We live outside Milan in a small villa with a garden and the dogs have access to the whole of the house, both inside and out. What about food… 13 food bowls? We feed them twice a day and each one has their own zone divided through the various rooms, so although they all eat at the same time, they’re not all crowded together. They are usually good at mealtimes and amazingly coordinated: as soon as the food is finished they all rush out into the garden to do their business. The last tour with La Scala at the end of the summer was just over a month long. How does Dario cope? When I’m on tour with the company, he is helped out by everyone. The last tour, though, was onerous for both of us. We’ve installed security cameras in the house so that when one of us is away we can see them, in that way we have less homesickness. What do your dogs give you? Contentment… love… it’s hard to explain a feeling that’s so strong. Certainly, without them I would not feel complete, and I could never live without at least one animal. EVER! What a wonderful interview. 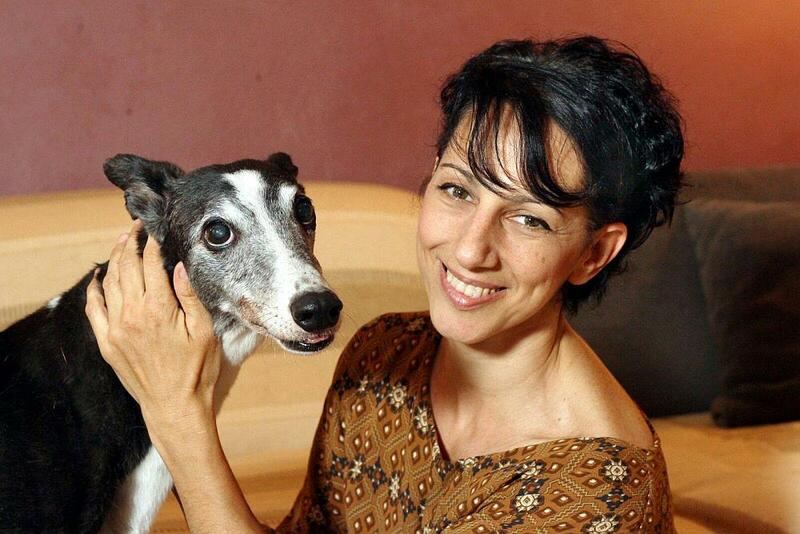 Greyhound rescue centres around the world do so much important — and, sadly, necessary — work. This couple’s dogs have a loving home and a positive environment. It is a story of hope, success, dedication and unconditional love. Thanks Graham for sharing this lovely story.What a joy ! How lovely! I am fond of these very gentle creatures; I like the symbolism in medieval art of their guidance, protection, loyalty, fidelity, and faithfulness. In England, many retired greyhounds from the racing world seek homes – apparently they aren’t at all interested in dashing around any more so are excellent companions! Must take ages to put winter coats on 13 hounds – patience and kindness are lovely virtues. Greyhounds are like chips – you can’t have just one!! Such an amazing woman to open her life and heart to these beloved dogs! I have fallen in love with greyhounds 3 years ago when I began to read about them. I have read all of the books and began to accumulate collars, snoodies, etc. preparing for one. Presently, we have 6 dogs (4 rescues) & have adopted 2 children so I’m waiting for the perfect time to bring a grey into our lives. I cannot wait! Thanks for sharing a glimpse into your life with your babies! It makes my heart smile! Sounds like Heaven to me. Having had rescue Greyhounds for 20 years they are the most gentle loving dogs. What a lovely lady.